People travel from all over the world to wed in our fair city. Why? Residents of Las Vegas, sometimes forget about the glitz and glamour. After you have lived in all that opulence for a while, it begins to lose its luster. The same thing could be said for marriages. A Vow Renewal Ceremony can help buff and polish the shine on YOUR marriage. Vow Renewals can be a great way to refresh and reaffirm your commitment to each other and share that with the world. 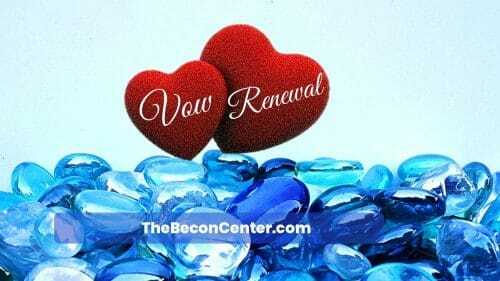 Is a Vow Renewal Ceremony Right For You? Another wedding?!? Ok, so most vow renewals are probably suggested by wives. There aren’t a lot of husbands keen to spend a fortune and go through the effort to have another wedding. The good news is you don’t have to. The Beacon Center may be your best bet. As an hourly rental space, no one else in Las Vegas offers you so much for such a small price. We have everything you need to renew your vows, without taking out a second mortgage. You supply the guests, food, alcohol, the cake, and the LOVE. As an hourly rental space, no one else in Las Vegas offers you so much for such a small price. Wedding Package – Includes lighted arch, card box, toasting glasses, cake serving utensils, flower girl basket, ring bearer pillow and MUCH more. Coordinating – We will work with your vendors to get them set up, work with you to make sure you do not forget anything you need. We also work with you on decorating and making your day perfect. Decorating – We will decorate the room for you. You provide us with the custom decorations you want us to use. We will supplement with decorations we have on hand and make the day special from the time you walk through the doors. Sounds great, where do I sign for my Las Vegas Vow Renewal? 50% down is needed to hold your date with the balance due 7 days prior to the event. You are welcome to bring your own food and drinks. Or, you may prefer to contact our independent caterers. They can provide personalized quotes directly to you based on your needs. Since opening the Beacon Center we have hosted dozens of celebrations. Let us put together a package that combines affordability, simplicity & fun. Just the thing to start the next stage of their life. Planner or Coordinator? Is There Really a Difference?